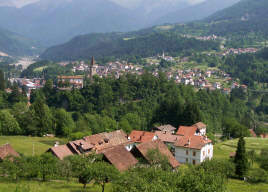 In the mountain area of Friuli-Venezia Giulia, the small municipalities lack of know-how, money and common strategies to improve their building strategies. Further, the region has not much experience with social housing. Therefore, MountEE gives an important support to achieve the objectives of Energy Performance of Buildings Directive of the European Union (EPBD) by 2018. In Italy there is a compulsory classification of buildings based on their energy performance. There are also some optional energy or sustainable classifications such as KlimaHouse, Leed (Green Building Council Italia) and ITACA (an Italian sustainable building tool). Since October 2011 there is a building energy and sustainable performance assessment system called “Protocollo VEA”, based on ITACA and SB Tool, a generic framework for rating the sustainable performance of buildings and projects. It is one of the most important catalogues of criteria for Environmental Quality Board EQB in Europe and in the world. This is a flexible framework which can be configured to suit almost any local condition or building type.